The City's fleet of garbage trucks collects refuse four days per week, collecting residential garbage once per week in four zones and daily for the central business district. The detailed map shows specific garbage collection zones and days. Please note: due to the large size and detail within the file, it will take some time to download, especially on dial-up connections. Garbage must be at the curb by 7:30 a.m. on your collection day to guarantee pick-up. Do not put cans or bags in the street. Do not use trash cans larger than 32 gallons in size, as larger cans cause lifting difficulties and hazards to garbage collectors. The City may refuse service for larger cans. 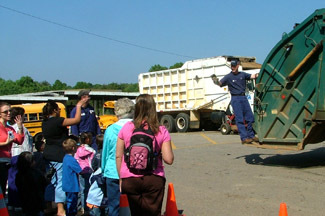 Garbage collection days are subject to change in the event of severe weather, such as ice storms, heavy snowfall or flooding. Check out the City's homepage for information on collection changes, including holidays. Scavenging or picking of garbage is strongly discouraged. Large bulk items such as furniture, appliances, etc., should be called in to Bulk Trash Pick-up program. To schedule a Bulk Trash Pick-up, call 276-403-5419 before 12 Noon the day before regular garbage collection day. Brush pick-up should be scheduled by calling 276-403-5141.